Warmly welcome all of you to this reception. We are gathered to celebrate the premiere of the ballet production of Jane Eyre. I am sure all of you share my feelings and are still enchanted by the wonderful performance we have all enjoyed this evening. Please join me in congratulating all the dancers from the Shanghai Ballet Company! The superb performance tonight from the Shanghai Ballet Company has given us all a great artistic treat. It also attests to their attainments in the art of ballet. There are many credits to this performance. But I want to highlight three points. First, it is a perfect match of the pen and the stage. Jane Eyre is world famous as a masterpiece of writing by Charlotte Bronte. Around the globe, and across China, the book has a large passionate following. It is also a must-read for English language learners. When I was young I read the novel with great interest. I consulted a dictionary many times and made profuse quantities of notes. I also watched the film Jane Eyre produced in the early 1970s. This film was shown in China and was immensely popular. The Ballet production of Jane Eyre is a re-interpretation of this literary classic. It transfers the story of the book to the stage. It portrayed characters through dancing rather than writing. Yet, what remains unchanged and equally powerful is the message: equality, courage and the pursuit of love. Second, it is the combination of the classic and the contemporary. The book Jane Eyre was written in the 19th century. It records the elegance and subtlety of the English social life at that time. The interpretation by the ballet retains the authentic English style in storyline, costume, scenery and music; but, this ballet production also has taken on bold modern choreography. The body language underlines speed and strength. At the same time, the dancers move smoothly with effortless grace. For me the ballet has brought not only familiarity of the original story but also provides surprise that gives added pleasure. The third point I want to highlight is how the ballet unites the West and the East. Last month the whole of Britain was on 'baby watch'. Indeed, people were thrilled by the arrival of His Royal Highness Prince George of Cambridge. This ballet production of Jane Eyre is a multinational 'baby'. It is a marriage of English literature, German choreography, French costume and prop design. Then there is the original adaptation of the Shanghai Ballet Company and performance by Chinese dancers. Of course, there is also music by British and German composers. So this ballet work is in every measure a new 'baby' created by Chinese and Western artists. The Shanghai Ballet Company has called this show a 'home trip'. It brings a Chinese interpretation of Jane Eyre back to the home country where the book was written. In fact there have been many other 'home trips' in recent China-UK exchanges. Last year, the National Theatre of China performed Richard III at Shakespeare's Globe Theatre. During the Edinburgh International Art Festival, the Shanghai Peking Opera troupe performed The Revenge of the Prince which was adapted from Hamlet. Next week, Beijing People's Art Theatre will stage The Tragedy of Coriolanus during this year's Edinburgh International Art Festival. This is another Chinese production of Shakespeare's work. 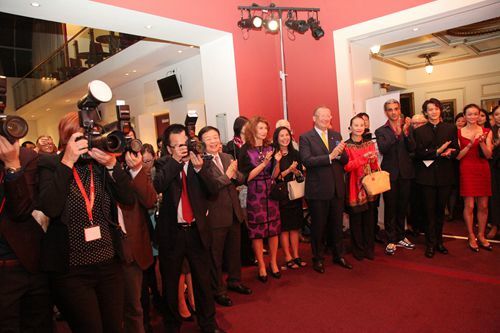 All these show that China and Britain both have rich cultures and our cultures are open and inclusive. Through mutual learning we have enriched our own thinking and art. These are also examples of ever expanding and deepening cultural exchanges between our two countries. I do hope that artists, cultural groups and agencies will enhance exchanges and cooperation and draw on each other's strengths. I hope we will put on more high quality shows and exhibitions in each other's country. Through collaboration we should aim to jointly produce more works reflecting our common values and feelings. Joint efforts as such will contribute to greater understanding, trust and friendship between Chinese and British people. In turn that will create a more stable and healthy China-UK relationship. 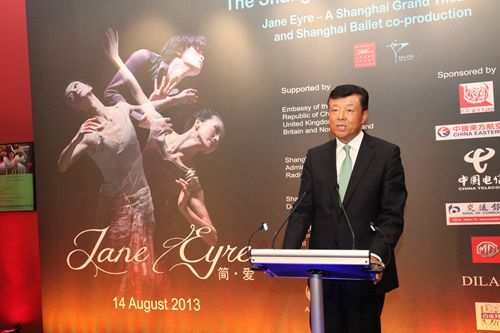 In conclusion, I propose a toast to the excellent debut of the Shanghai Ballet Company with Jane Eyre! I wish them great success for many performances!